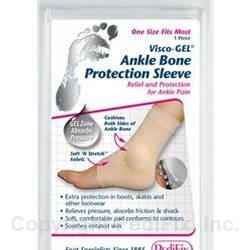 Unique Protection Sleeve keeps soft Visco-GEL® pads in place on both sides of the ankle bone or ‘malleolar’ to cushion and protect. Helps make shoes, boots and skates more comfortable. Absorbs impact, shock and friction. Also effective after injury and under ankle splints and braces. Washable and reusable. One size fits most. 1 per pack. Slide on foot. Position gel pads over ankle bones. Hand wash and rinse thoroughly. Press flat in a towel to remove excess moisture. Air dry completely before reuse. If you have diabetes or poor circulation, consult your doctor before use. Do not place product on an open wound. If irritation, discomfort or poor circulation occurs, discontinue use.